Apple plans to adapt its successful app store model to Mac computers, while many other tech companies follow. 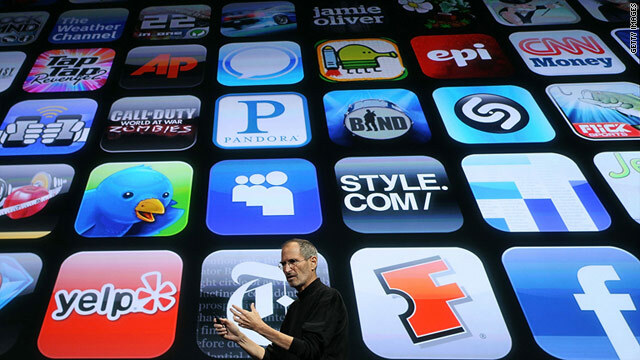 (CNN) -- App stores are booming, but there may not be enough applications to fill them all. Google, Apple and Facebook all maintain app marketplaces for their respective platforms and more companies are preparing to launch their own stores. With their online storefronts, big technology companies help smaller developers reach vast audiences. But beyond big, established app retailers like Apple's App Store or Google's Android Market, will these rivals be able to find developers willing to custom tailor software for their systems? And will enough consumers bother thumbing through their catalogs? Even in the hot smartphone app space, manufacturers of the most-used platforms are struggling to attract developers. Nokia and BlackBerry's maker, Research in Motion, both lag behind other smartphone platforms in attracting new software. Each have less than a tenth of the number of apps in the second-place Android store and far less than Apple's, which has more than 300,000. For its Windows Phone 7 system, Microsoft paid some developers and offered free hardware to coax them into building apps. Even still, prominent developers such as Jack Dorsey, co-founder of Square and Twitter, say they're taking "wait and see" approaches. Gowalla, the location-based networking service, says it's only focusing on a few of the most popular platforms for apps. The company's resources are limited, and finding developers experienced with lesser-known platforms is difficult, Gowalla CTO Scott Raymond said. Browser makers Mozilla and Opera Software are each working on app stores that could tie into their desktop and mobile browsers. Mozilla Labs, the research and development arm of the company that makes Firefox, is working on an app framework that spans desktops and phones. "I believe very firmly that we're at the beginning of a major explosion of this," Mozilla Labs Director Pascal Finette said recently. "Before the iStore, there wasn't a concept of a 99-cent application -- and kudos to Apple for that." Mozilla's plan is to create a system to sell powerful apps that work in browsers on most platforms. "You need to have an underlying architecture, the plumbing, to do all of this," Finette said. "What we'd offer is a simple technology that supports multiple stores," Mozilla product vice-president Jay Sullivan said in an interview. He described the concept as a "shopping mall" for app stores. Google recently opened its Chrome Web Store for listing free or inexpensive "Web apps," which are indistinguishable from websites save for a button that's installed on the browser's start page. Early users say they're confused about why this much-touted feature appears to be nothing more than a new means for creating bookmarks to Web pages. The store organizes what's out there and aims to help people discover apps through ranking systems and search, according to Google. This is supposed to simplify that process, especially for owners of yet-to-debut netbooks running Google's Chrome OS. Online retailers traditionally register with third-party payment platforms or install payment infrastructure on their websites. But PayPal, one such payment provider, plans to launch an app store of its own next year. Web and mobile apps may soon be found, bought and, in some cases, used through PayPal.com. Google takes a cut on apps it sells through the Web Store, like it does for the Android marketplace for smartphones, which has 130,000 apps. Proprietary app stores from Verizon, Amazon and others will soon join Google's official market on Android. Taiwanese smartphone maker HTC is also weighing opening an app store, according to a report in the Financial Times. Apple kick-started the lucrative business of selling software in a central, curated shop with its iPhone App Store. (Mobile apps are popular because they can do more with the smartphone's unique hardware features than a website can.) Apple plans to extend that idea to its laptop and desktop computers on January 6 when it cuts the ribbon on the Mac App Store. Acer, the world's second-largest PC maker, says it plans to launch a "next-generation" app store. While these stores can be rewarding for those running them, there's fear that customers could get nudged toward more expensive apps because they generally yield higher returns for shop owners. "I don't know if we need them," Christa Quarles, the chief financial officer for the Walt Disney game company Playdom, said of app stores at a conference last month. "What is an app store at its core? It's a search engine." "The search engine is biased toward whatever pays," when the company running the system profits from paid apps, Quarles said. And it remains to be seen whether the influx in these online app storefronts will supplant social media and other channels as the primary way most people discover new sites. The challenges with convincing developers to list -- and in many cases, pay member subscriptions and per-sale fees -- are even greater when platform providers, like Facebook, Mozilla and many others, ask them to incorporate proprietary code. Yahoo CTO Raymie Stata referenced his company's app platform in a recent conference fireside chat, describing it as a project that's "less known." If a developer jumps through the hoops and adheres to Yahoo's guidelines, they can potentially reach some 134 million visitors to Yahoo's home page and other properties, according to Compete traffic data. Despite Yahoo's much-coveted numbers, the company has struggled to attract developers to its platforms. Among Facebook's top priorities, says CEO Mark Zuckerberg, is its platform. The company is currently extending it deeper into smartphones, bridging the gap between mobile and desktop. The two areas will quickly merge, and the Web may be the collision point, Jim Lanzone, the CEO of video app maker Clicker, said at a conference recently. "We needed apps because browsers were very hard to navigate," he said. "Browsers and apps are starting to merge." The number of incubating and fledgling app stores seems to grow every week. We'll soon know if there are there enough virtual inventory and customers for all these shops to survive.